With beer bread biscuits and all the cheddar cheese! 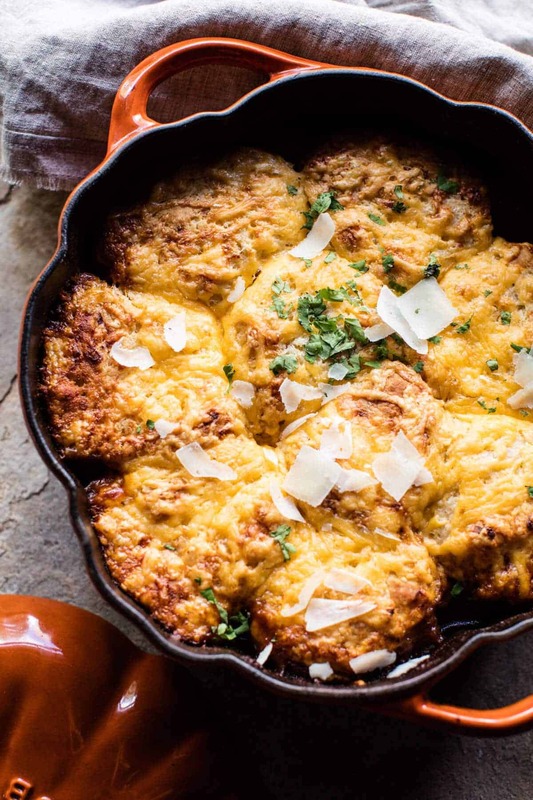 Because it’s fall, and comfort food is a must. So I’ve spent the last three days working on some new videos for you guys, and in preparation for these videos I had to look back through some older content on the blog. And when I say old, I mean old! A couple of week ago I stumbled on this recipe from way back in the day. It honestly pains me to look at those photos, BUT when I remembered back to the recipe, I couldn’t help but think, “man, I really need to bring this recipe back to life somehow because it’s like, SO GOOD”. Enter this Beer Braised Chicken Pot Pie. It’s the same beer braised chicken, BUT with cheesy beer bread biscuits on top. Yes, yes, yes! I mean, saucy chicken is good, but saucy chicken with buttery beer bread biscuits… a million times better! <–like for real. I hope I’m not boring you guys with all my cozy eats, but I really just cannot help it. 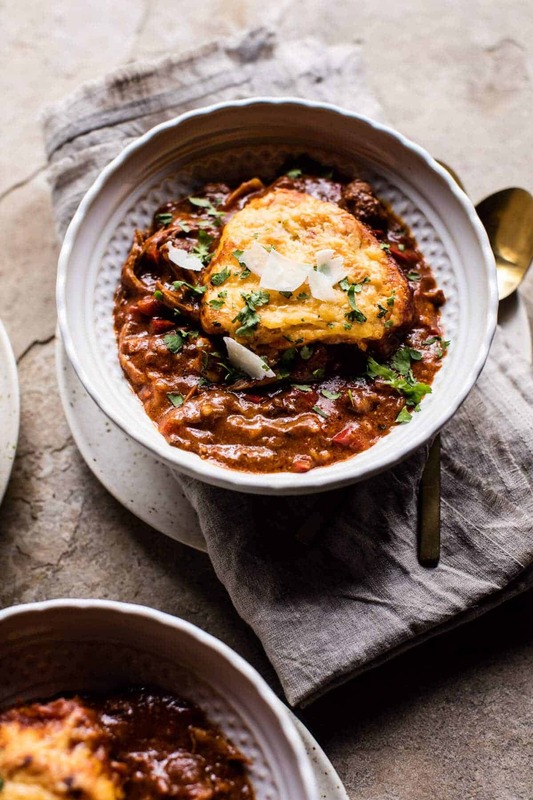 With all of the chilly nights we’ve been having, it’s all I am craving…just crossing my fingers that you guys are feeling the same way because there are more cozy eats to come. When I was making this dish the other week, I was other in the middle of making a million other things as well, but I cannot lie, this was totally what I was most excited about. Okok, AND maybe I was also overly excited because this happened to be the day I found out that the Gilmore Girls A Year in The Life is going to be premiering on Netflix November 25th…aka black Friday!! Meaning the perfect day of the year to chill on the couch and binge watch all four ninety minute episodes. Please tell me that I have some Gilmore Girl fans out there that will be doing the same?? I already have plans to have basically a second Thanksgiving, only Gilmore Girls style. Meaning coffee, doughnuts, pop tarts (homemade of course! ), tacos, pizza and um, ok all the Christmas cookies and hot chocolate too…obviously. Can you say world’s biggest dork or what? Whatever. Don’t even care. I am pumped. ? Wait, do you think this is something Lorelai and Rory would eat? I dunno, it feels kind of put together for them? But maybe not cause, chicken + beer + biscuits seems pretty Lorelai Gilmore, no? Anyway, not sure how I got so off topic there…let’s get back to this pot pie! So here’s the run-down for this beer braised chicken pot pie. 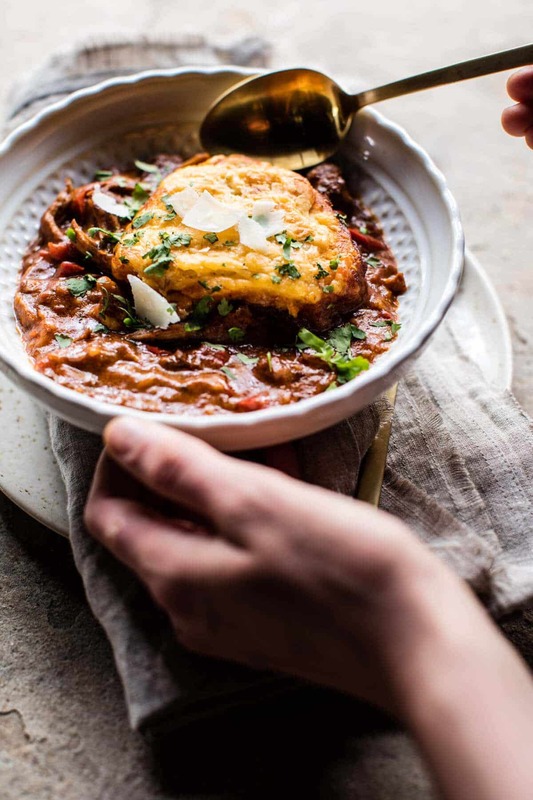 It all starts off with that braised chicken, cooked in pumpkin beer with onions, bell peppers and andouille sausage and then finished with the simplest, most delicious beer bread biscuit topping. Oh, and a little cheese too, you know, for good measure! Then just bake and eat! Pretty simple, but so good. The secret here is the pumpkin beer and andouille sausage, these both add so much flavor and the sausage adds a nice smoky kick! If you’re not a fan of pumpkin beer, use your favorite variety, and if you don’t drink beer, use chicken broth. From start to finish you can make this all in one pot if you choose, just make sure to start cooking everything in an oven safe pot. If you don’t have an oven safe pot, just transfer the braised chicken to a baking dish and top with biscuits. Oh, and did I mention this is kind of a crowd pleaser? Cause it is! Do you remember over the weekend how my brother Red had that snowboard movie premiere in Aspen? Yeah, well that meant my parents house was full, which meant I was cooking, which meant this was dinner. HUGE hit, no leftovers in site. Beer Braised Chicken Pot Pie with Cheddar Biscuits. Heat a medium pot (preferably oven safe) over medium heat and add the olive oil. Add the onion and cook, stirring often, until softened, 10 minutes. Add the bell pepper, chili powder, paprika, thyme and cayenne and season with salt + pepper and cook another 5 minutes. Pour in the beer. Add the chicken, sausage, tomatoes and green chilies, stirring to combine. Bring to a simmer, cover and simmer 25-30 minutes or until the chicken is cooked through and shreds easily. Shred the chicken with two forks, leave to simmer. Whisk together the heavy cream and cornstarch and stir into the chicken. Simmer 5 minutes and then remove from the heat. Meanwhile, combine the flour, baking powder and butter in a medium bowl and toss to combine. Add the honey and beer and mix until just combined. Fold in the cheddar. Remove the chicken from the heat. If not already in an oven safe dish, then transfer to one. Drop 2 tablespoons of biscuit dough over top the chicken. Place in the oven and bake for 15-20 minutes or until the biscuits are golden. Remove from the oven and let cool 5 minutes. Eat! 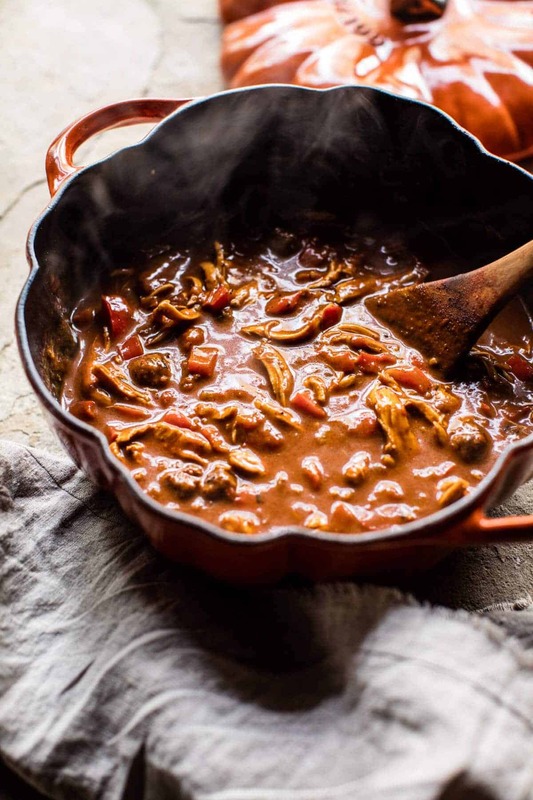 Spicy Cider Beer Braised Chicken Enchilada Tacos w/Sweet Chili Apple-Pomegranate Salsa. I am so recreating this dish, with more veggies added, because I need my greens and oranges and reds ahahahahah!! Perfect!! I hope you love it, thank you Ruth! For the biscuits, there is no beer listed as an ingredient but there is beer in the instructions. Which is correct? Thanks. 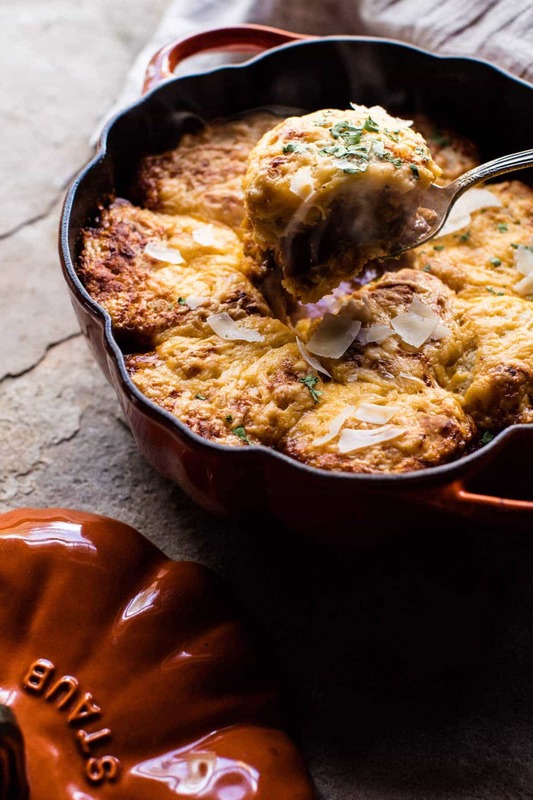 Oh wow, you’re recipes always look so amazing and this one is no different – also, can we discuss your perfectly fall themed pumpkin Staub ovenproof dish?!!? That thing, is amazing!! I love it!! This looks SO yum! and please; you’re talking to the person who owns all 7 seasons and has marked November 25th on her calendar. Rory and Lorelai are my spirit animals and I totally think this is something Luke would serve Lorelai from his “off-menu”. 😉 Are you Team Dean;Team Jess;or Team Logan? I am actually hoping they bring someone new into the picture. Hi! OMG Ok, so I am torn, but I think I am actually team jess, but I don’t know. I cannot wait! So excited you are GG fan! 🙂 Have a great weekend! This looks so good! I plan to make it soon. How much beer did you put in the biscuits? Hey Sue! I am so sorry! It is 3/4 of a cup and the recipe is fixed. Thanks for pointing that out. Let me know if you have other questions. Thanks! I don’t mind the cozy recipes one bit because it is freezing here! Looking absolutely glorious and those beer biscuits… Aaah yum. Well I am so happy you are loving this, and its perfect for the weather. Thanks so much Maëva! This looks amazing. 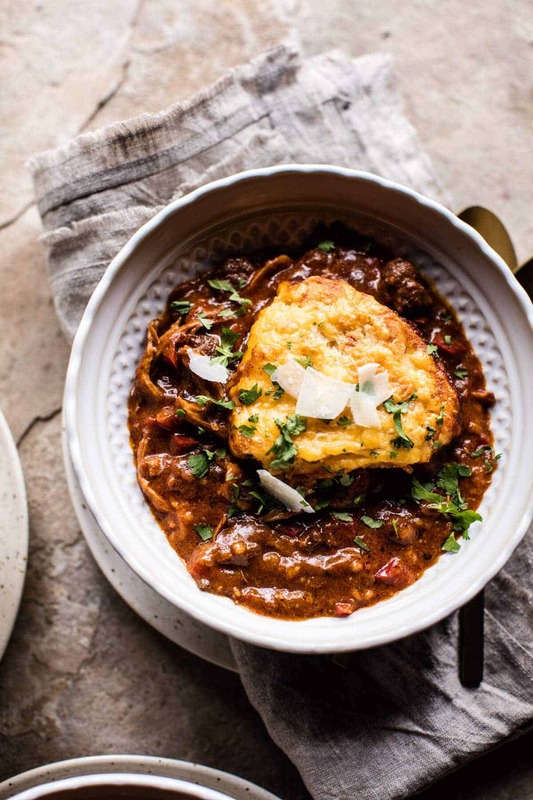 Could you do it in the slow cooker? This looks like a perfect Sunday dinner for fall. I was just thinking of making pot pie!!! this will definitely be made this week! Perfect! I hope you love this one Jessica, thanks!! Looks great!! How much beer goes into the biscuits?? I am so sorry! It is 3/4 of a cup and the recipe is fixed. Thanks for pointing that out. Let me know if you have other questions. Thanks! Just yesterday I was looking for an updated chicken pot pie recipe and I think I found it! Thank you for reading my mind 😉 I’m going to make this along with the apple crumble cake for a nice, cozy dinner! Sounds so amazing Sarah! I hope you have an awesome dinner tonight, thank you! Oh I think Lorelai would be all over this. You know what, I think she would dip chips into it! 😉 I am totally stoked for the Gilmore Girls reunion episodes. I am trying to make sure I have all of my course work done before then, and I too am planning on making a bunch of things that the Gilmores would snack on. Definitely second Thanksgiving, hee hee. Sounds amazing Kate! Thank you so much! Wait, what? Beer in chicken pot pie. 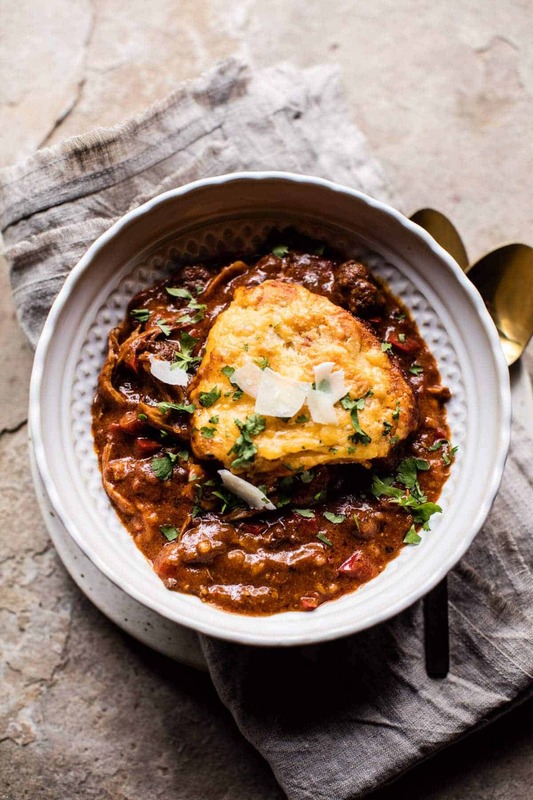 Definitely a crowd pleaser comfort food. this looks UNREAL!!!!! so obsessed with the colors, they are gorgeous! This looks delish!! Cannot wait to try! What about the rest of the dough? Don’t you mean make individual biscuits and place/cover them over the top of the chicken filling? Still, looks amazing. Definitely a chilly evening dinner. Thanks! This looks and sounds so amazing!! I’ll be fixing it ASAP!! Thanks for sharing 🙂 I’m wondering what the Oven Temp. is for those marvelous Cheesy Biscuits? Could you make a Gilmore Girls themed party post?!! That would be amazing and perfect since it’s totally a fall/comfort food show. OH!! That is such a great idea! I will have to think about this! 🙂 Thanks for the suggestion! 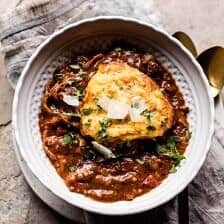 I just started really following this blog a few days ago and fell in love…been my comfort, going thru all the great rustic recipes! I made bread beer to great compliments… made this as my first entree from the site and loved it! Thank you for sharing and your hard work and passion! It’s such a great site. I really appreciate you sharing with us! Yum!!!!! 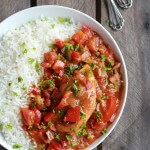 I am making this for dinner right now! It smells ridiculously amazing!!! Did I miss the oven temp for the last step? 375 degrees! So so sorry about that! hope you love this! I cooked it at 375 for 20 minutes and it came out great. Also, I went by the pictures and layered the cut biscuits over the Dutch oven that I cooked the chicken in. It was really yummy – I think I’ll try it again in individual ramekins and cut the dough to be the size of the ramekins. I might also add more veggies like zucchini, peas or carrots. But I love the idea and it was a hit for a small dinner party I threw. Perfect! So happy to hear you loved it, thank you Asa! Oh my goodness, can I come to your Gilmore Girls party? haha. That seriously sounds like the PERFECT day. And this pot pie looks so good! Especially those biscuits. YES! Haha! Yes!! Its going to be the best!! Thanks Chelsea!! OK love that you’re a Gilmore Girl fan….and yep..planning on doing just as you are..binge watch with all the fixings..ao glad I found your blog..thanx instagram?..and cooking this right now..smells great on a cool fall day…love the pumpkin pot. …cheers! Ah I can not wait!! So happy you found my blog too!! Hope you love it!! Thank you!! This was fabulous. …. and the aroma of it filled the house…and smelled amazing & the taste was even better…definitely a hit! !..one pot dinners rule!! so much flavour here….thank you! !…I’m following your blog now …..?????? So so happy to hear you loved this recipe and my blog ? Thank you Kimberley! This looks delicious! Just have a question about the biscuit dough you said to drop 2 tbsp of batter over chicken. I’m think I should do this several times over the entire dish?? Can you pleas clarify? Thanks! Hey Amanda! Yes, use up all the batter and drop it several times over the dish. Sorry for any confusion! Hope you love this! ? This recipe looks awesome! I’m a huge fan of your recipes. Haven’t had one failed meal yet. 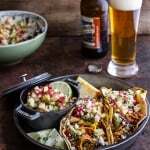 I love recipes with beer, since we’re huge craft beer lovers at our house. 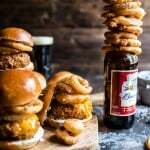 Yet, whenever I cook with beer, the meal generally comes out too bitter. Any suggestions? Delicious! What oven temp do you use to finish off with the biscuits? Hey Stephanie! it is 375 degrees F. Sorry about that! Apologies – accidentally put these questions on the wrong recipe!! As per usual, this recipe looks fabulous! 2 Questions for you –Do you think that the cream could be substituted with milk? 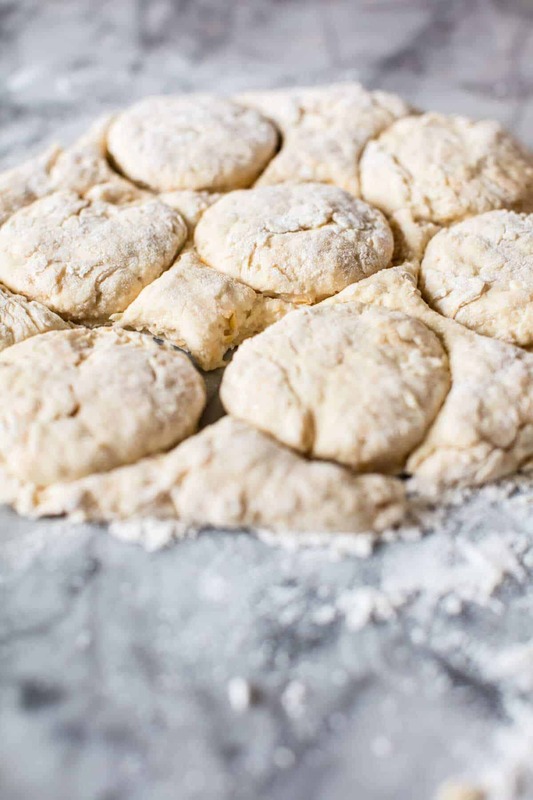 Or would that throw off the consistency/ creaminess too much?And I’m hoping to make this on a Sunday and use as lunches – would you recommend doing the biscuits on the side, or will they keep just fine if I bake them on top?Thank you!! ? haha! Ok it’s actually the same answer for this recipe too soo…. Hey Rebecca! Milk should work just great and as for the biscuits, yes, I would make them on the side. You can bake them at 350 on a baking sheet. Let me know if you have questions. Thank you! ? I am so excited to make this! Making for my whole family for Sunday dinner, wondered if you think i can make the chicken mixture a few days in advance and then heat it up and bake with the biscuits a few days later? Thank you! Hey Whitney! So sorry for the delay. Hope the dinner turned out amazing! For the future, yes you can make the chicken in advance and then just add the biscuits before baking. Please let me k ow if you have other questions. Thank you!!! 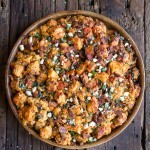 I just discovered this blog and already have at least 10 recipes saved for later. I’m so excited to try this one, but I couldn’t find cornstarch when I bought the ingredients. Is it necessary? Is there something else I can sub for it? Thank you! YAY! So happy you loved this one Mari! Thank you!! I made it! So yummy but mine turned out really watery. I followed the instructions to a T….can’t figure out where I went wrong. Hey! I would just simmer the chicken longer until it thickens for you. So happy you loved this! Thanks! Hi, I gotta say this recipe looks absolutely delish! I’ve decided to make it for my birthday dinner party next weekend, hope it will please my crowd as it has yours. 🙂 I was just wondering if you think it would be ok to substitute the pumpkin beer, which I don’t have in my country, with apple cider? I was thinking that it might add a nice sweetness to it. Also, since I want to be with my guests as much as possible and avoid spending too much time in the kitchen, would it be ok to make the chicken mixture a few hours in advance and to then top it with the biscuit dough when I’m ready to put it in the oven? Can I make this with any beer, and not pumpkin beer specifically? Hi! Yes, any beer you drink will be great. Hope you love these! I am confused by this ingredient: 1 ounce pumpkin beer 12, or your favortie beer. Did you mean “1 12-oz pumpkin beer, or your favorite beer”? If not, how much beer goes into the chicken dish itself? So sorry for the trouble, you need 1 (12 ounce) beer. hope you love this!! You totally rocked it with this recipe! My husband LOVED it! And he’s quite the cook himself. Thanks! That is amazing! Thank you Jenna! This recipe was great, I used boneless chicken thighs and baked a more basic biscuit separately. Result was flavorful and spicy. Next time I might serve it with rice as it came out almost like a gumbo. Made this for the second time yesterday and am very excited about my lunch leftovers! This was so so good! I made it for a holiday party for my friends and it was a huge hit! I am so happy to hear that! Thank you Rachyl!